Humor me while I talk about sugar and water please. Late last night I was all prepared to tell you about chicken today. It was the plan. But then I was all… it’s Monday. Coffee Monday. Who cares how simple? We must discuss. 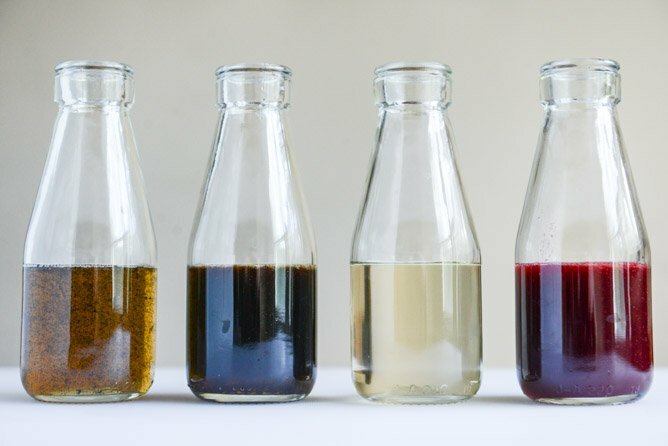 These syrups. We gotta talk about them. I made homemade vanilla bean syrup. Traditional and easily loved by me. Cinnamon brown sugar syrup – because earlier this winter I was losing my mind over the dunkin donut’s flavor. Homemade almond syrup, because anything amaretto flavored makes me nutty. Pun intended. And my real – but shocking – favorite: fresh blackberry syrup. GAH. I love it so much. I don’t care much for raspberry flavored things, but the idea of blackberry? I was all over that. It is SO good. And you can obviously use these syrups for other things, I mean this is embarrassing because they are literally just flavored simple syrups. But, like, why haven’t I been doing this for a year? 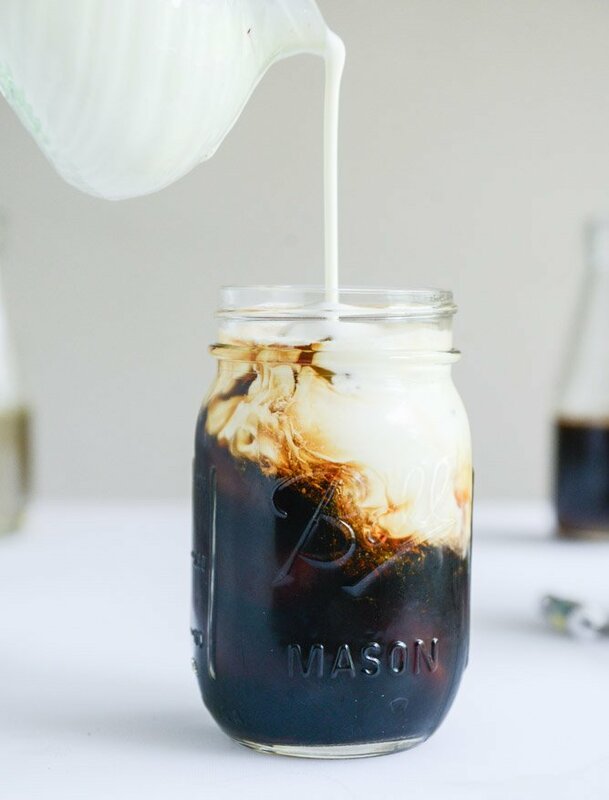 Ever since making this fresh mint syrup for iced coffee, I’ve been read-my-lips-OBSESSED with making homemade coffee syrups. And even though I lost my taste for coffee a few weeks after sharing it, I was still so in love with the whole coffee experience that I wanted to KEEP drinking it. Kind of like how I forced myself to drink it in the first place. The problem was that I’d go get some and no matter how small the size was, I’d only take a few sips and have to be done. Just couldn’t do it. 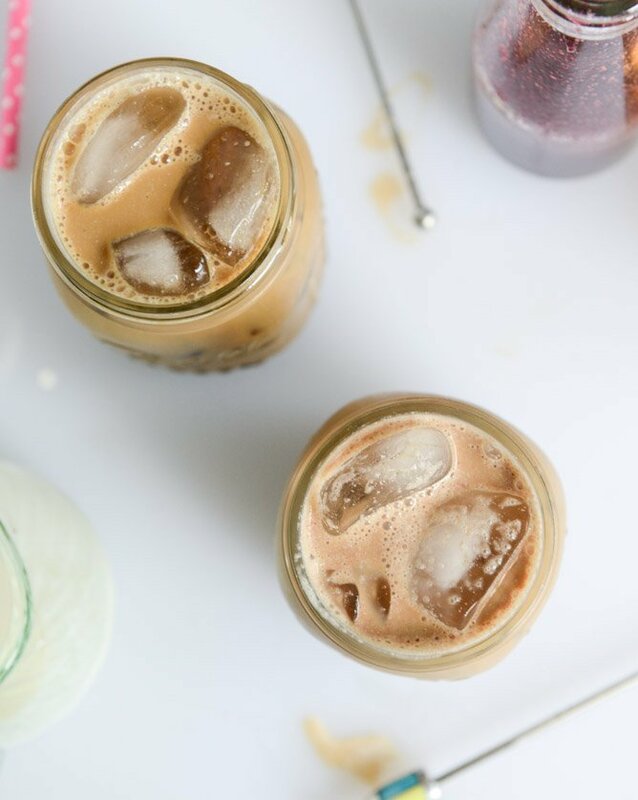 I did go a few weeks completely without a drop of coffee, but then the taste came back to me and I’ve thoroughly been enjoying it – iced only. Sometimes I’ll still head out and get coffee – though I’ve never been able to finish one, so it’s much better if I just make it at home. And EASIER! And cheaper. Says my raging basic Starbucks addiction. Back in April I also shared a cold brew concentrate method with that but over the months have been loving this one below so much more. It’s kind of a major pain to grind the beans but I tell you: the flavor is so much better. I’ve done regular and decaf beans. I’ve experimented over and over with using filtered versus unfiltered water and surprisingly prefer the filtered. I didn’t think it would make a difference, but it does. TOTALLY. Is it less acidic? Are my taste buds just in overdrive? Either way, I’m finding it WORTH IT. Big deal for this person. Also, I find it easiest to just use a bowl or a pitcher. I have a Toddy, but it’s rather obtrusive and, well, the real issue is that my husband LOATHES coffee and the scent so much that if it’s in his view or if he gets one whiff, he throws a major tantrum. I think that’s weird because even though I’ve spent most of my life hating coffee, the scent always brought me back to my childhood and gives me warm and cozy nostalgic feelings. My not-so-secret love for the blackberry syrup comes partially from the color. It kind of tints your coffee (if you’re using cream) to a purpleish-fuschia color and I think it’s gorgeous. Leave it to me to like a drink for the color. I mean, it tastes great too but just look. It’s PINK. Or red. Whatever. 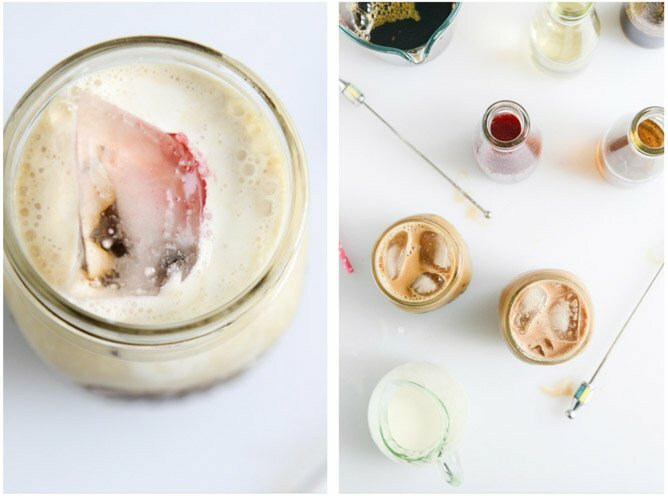 So I’m just in love with this idea of homemade syrups and multiple syrups, and having them on hand so you can have little coffee parties with pals. 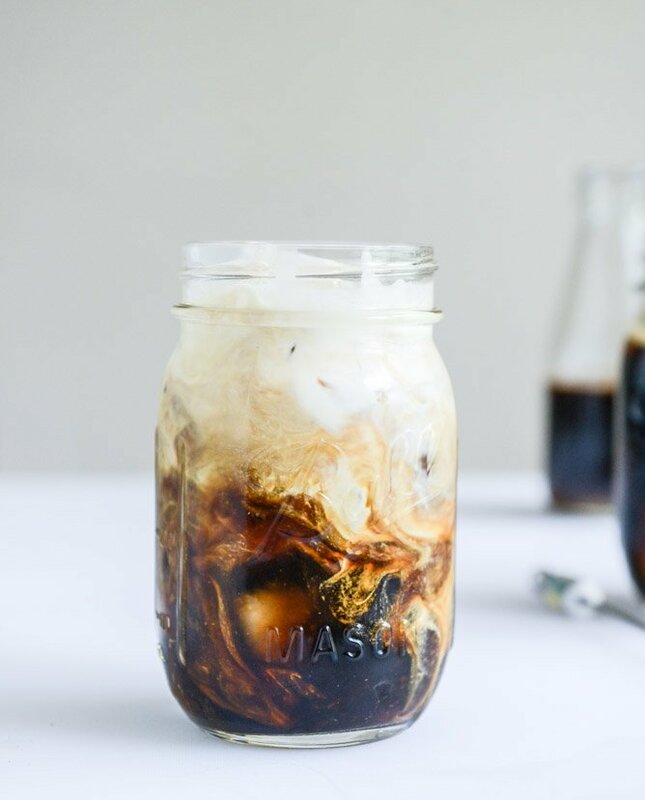 The syrup mixes into iced coffee beautifully – but after a while some will settle on the bottom just as it would with iced coffee you order out. My simple solution is adorable mixers. It works in hot coffee perfectly and I can’t get enough. And it can work in other things too – like even making some almond hot chocolate and all that jazz. But let’s not talk about that in summer. 5 cups filtered water, this made a HUGE difference in how I liked iced coffee at home! The next morning, strain the coffee through a few layers of cheesecloth or a coffee filter. It’s key to reduce the granules. Now you have your coffee! 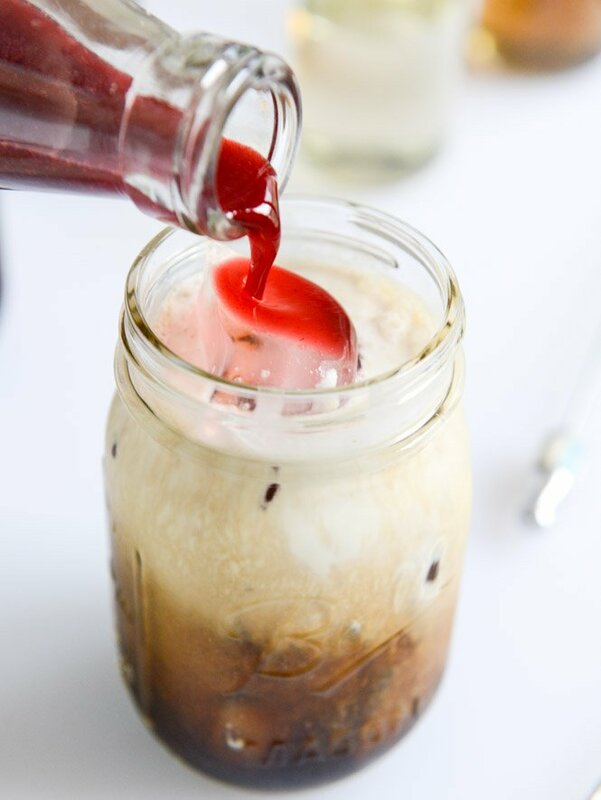 Fill a glass with ice, add your desired amount of coffee and cream/milk – then go to town with the syrups. Note: the syrups should be stored in a sealed container in the fridge. They should last a week or two! Combine the sugar, water, scraped vanilla beans, whole bean and extract in a small saucepan over medium heat. Whisk constantly until the sugar dissolves and the mixture is bubbling. Reduce the heat to low and cook for 1 to 2 minutes. Let cool completely before storing in a jar. I usually don’t remove the vanilla pod and just leave it in for flavor. You can remove it if you wish! Combine the sugar, cinnamon and water in a small saucepan over medium heat. Whisk constantly until the sugar dissolves and the mixture is bubbling. Reduce the heat to low and cook for 1 to 2 minutes. Let cool completely before storing in a jar. Okay. I’m done being boring with coffee now. Swear. i love vanilla bean syrup but i’m not understand which vanilla should i use ..? 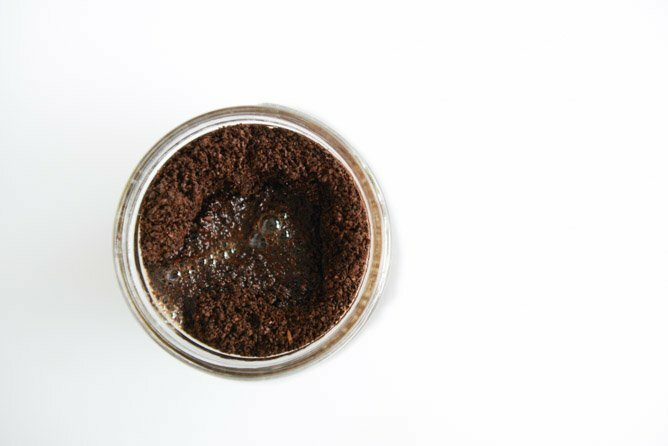 Ideally, scape the seeds from a vanilla bean AND use half a teaspoon of pure vanilla extract per one half a cup of water and a third of a cup of sugar. 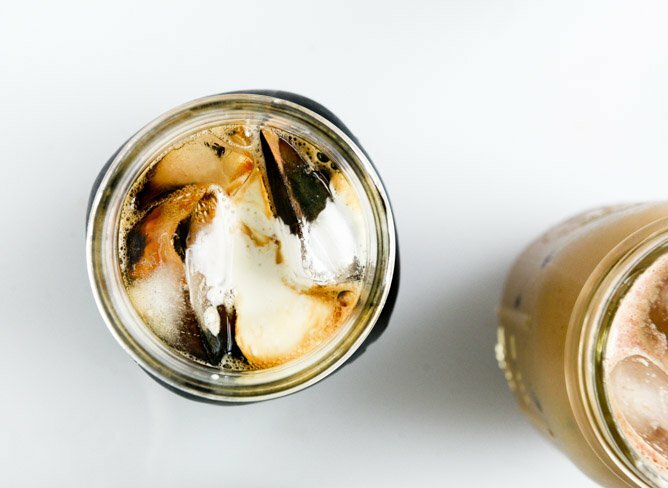 What kind of coffee beans do you use for cold brew. I’ve been having trouble finding the right roast for iced coffe/cold brew. how long ca you store the syrups for? I use the same recipe, but have discovered the magic of using a nut milk bag to hold the coffee. It is basically like a giant tea bag, and saves me from having to filter the brew. SO GOOD! I make almond-vanilla syrup using Madhava 5, which is a combo of low-glycemic sweeteners. I put it in a pump bottle and I add an ounce of vodka as a preservative per 16 ounces of syrup. It can also be refrigerated. 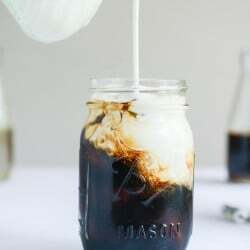 Next I want to try using Madhava 5 for a caramel-bourbon syrup. I have the natural extracts, but I’m nervous about how much extract to use for 16 oz. i would like to know how to prepared Chocolate hazelnut coffee syrup …. I made a cinnamon, vanilla, almond. It’s amazing! 1 cup water, 1 cup splenda, 2 tsp cinnamon, 3 tsp vanilla extract, 1 tsp almond extract. It can be made with sugar in the same amount. Pingback: 10 χρήσιμα και πανεύκολα hacks που θα λύσουν τα χέρια οποιουδήποτε λατρεύει τον καφέ! Very old post now, but seriously… if a grown person is throwing tantrums over another person’s beverage choice, that person is being very badly behaved and needs some therapy. That’s controlling behavior. That’s not behavior to model for a child, and it’s not something that makes a healthy relationship. I’m not a fan of my spouse’s hot sauces or stinky cheese preferences, but I’m not putting them in my body and I don’t have to clean up after sauce production. It’s unreasonable to throw tantrums because the other person likes something not to one’s taste.